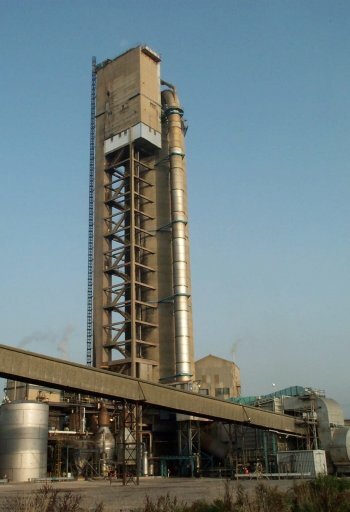 The Severnside prill tower was operated by Terra Nitrogen (UK) Ltd to manufacture ammonium nitrate fertiliser. 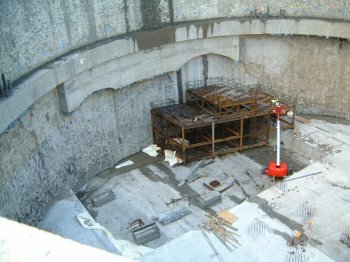 Despite a history of regular maintenance and repair, parts of the reinforced concrete structure deteriorated over the years due to the severe operating environment, and eventually significant structural repairs were required. 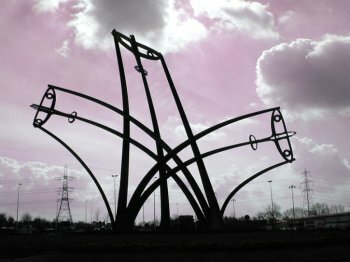 ABB formulated an outline repair strategy and design and technology consultants Taylor Woodrow were appointed undertake the complete project management including the design and supervision of the remedial works. Taylor Woodrow chose to use LUSAS Civil & Structural to assist with the complex task of modelling the demolition and re-construction sequences to replace the degraded concrete in the tower whilst keeping the plant operational throughout. The tower was constructed in 1964. It consists of a 86m high, 15.6m diameter drop shaft of 178mm thickness. A five storey reinforced concrete plant house, supported on the drop shaft, a lift shaft and a single braced column, forms the upper 75m to 100m levels. Despite protective measures being undertaken during its construction a number of concrete repairs have had to be made during the towers life. 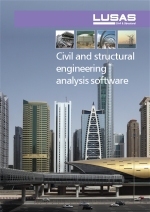 Prior to the detailed staged construction design a LUSAS analysis of the complete structure was undertaken for dead, plant, circulation and wind loads to assess the structural behaviour of the tower both in its as-built and current deteriorated condition for checking with relevant design codes. Fine mesh divisions were used in areas of repair and coarse mesh divisions used in areas remote from the plant house. Results from the as-built model confirmed the behaviour of the structure and identified areas where high stresses could be expected. Results from the model incorporating reduced modulii of elasticity for all areas of degradation showed how initial as-built forces had redistributed due to the ammonium nitrate attack and indicated an even more urgent need for the remedial work to be undertaken. This latter analysis also proved extremely useful in deriving subsequent repair sequences. In all, over 100m2 of drop shaft wall and damaged areas of beams, columns, slabs and walls for a number of levels of the plant house required replacing. The complex sequence of structural repairs was modelled in LUSAS using the birth and death facility. This allows elements to be de-activated to simulate areas of concrete removal, resulting in stress redistribution in the model. Following repair, the elements are re-activated with corresponding new material properties. In this manner a structural assessment was undertaken for all stages of the repairs to the tower including the use of major temporary works such as support frames, props and jacks to ensure the structure remained safe at all times. While some local patch repairs were necessary at the lowest level of the plant house the areas requiring most extensive repairs were between level 5 and the roof at 100m level. Each level of the plant house presented different problems and required appropriate repair sequences and temporary support arrangements. At each stage of the repair sequence the forces in both temporary props and the support frame and the walls, columns, beams and floor slabs of the plant house were examined in LUSAS to ensure the structure remained safe. For the temporary support frame calculated deflections were compared with on-site measurements to ensure nothing unexpected was happening. In general, good correlation was achieved confirming the validity of the LUSAS modelling and design calculations. Previous patch repairs to the drop shaft wall had indicated that such repairs should be undertaken by a staged replacement of alternate panels not exceeding of 1m x 2m in area. However, by using appropriate temporary works including jacking, LUSAS confirmed that considerably larger areas could be broken out and repaired in a single operation. "Adopting the 'birth and death' technique in the LUSAS analyses gave us a high degree of confidence that the structure would remain safe at all times. This was of prime importance as the plant had to remain operational thoroughout the duration of the repair contract."